Terra and Rob will have their wedding photography free this fall, after winning Brian Zinchuk Publishing's Free Wedding Promo 2011! 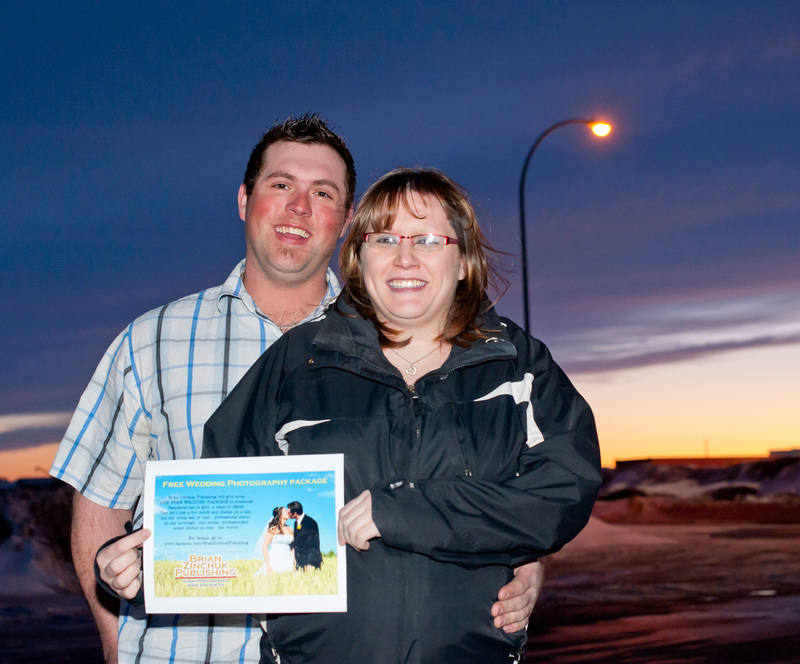 Terra and Rob of Weyburn were the first to hit 100 Facebook ‘likes’ on my Free Wedding Promo 2011 last week. I met with them on Monday evening to make arrangements for their October wedding. I have to say, this couldn’t be going to a nicer couple. I am so thrilled to be able to do this for them on their big day. I’m bubbling over with ideas. We’re going to have a lot of fun during the shoot, and might even roast some marshmallows! (Mmmmm…. marshmellows…) We’ll just have to make sure none get on the dress. They will be getting the Silver package, a full day’s worth of photography, a professionally edited and produced album, wall prints for themselves and their parents, and the files on disk. I will even include a USB drive to view photos on the big screen TV. They were brave enough to stand outside the Weyburn Tim Horton’s in a stiff breeze for this picture. I think Rob might have needed to thaw out afterwards. Calls are coming in, and I’ve already had two inquiries for one date. So if you’re in need of a photographer, don’t delay in contacting me, because your date might get snatched up quickly. Again, congratulations to Terra and Rob.